What a great tote! 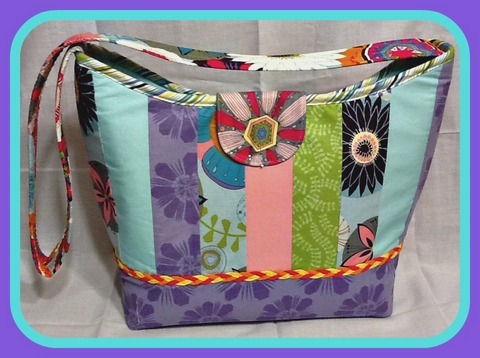 The Calypso Tote came about as a class project and it is so handy! It is a very large tote and will carry many things. 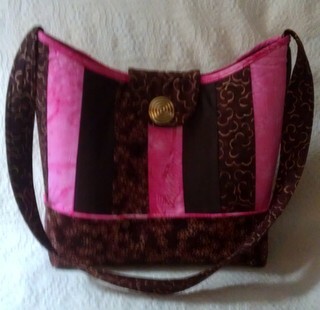 It has pockets inside to fit a tablet type device on one side and several pockets on the opposite side to fit cell phones, notebooks, pens, a wallet and many more things. It is about 17" wide x 15" tall when finished, large enough to carry my 15" laptop with some accessories. 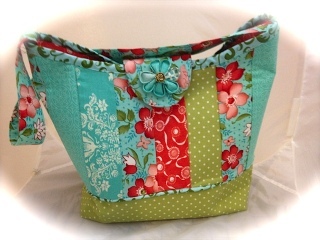 You can do so many things with the outside of the tote to make it your own. Instructions are included for a strip pieced outside but you could easily substitute plain fabric or embroidered fabric or just about anything! Be creative and make your own. Be sure to send me pics! Diagram instructions in a pdf format for easy printing. Here are a few that have been made by friends or in classes. Be sure to watch on Fons and Porter for Pam to demo hers. Below you will see the ones that Phyllis, Secret and Barbara made when they had a fun day of sewing together!